I must apologize for my absenteeism from writing my blog. I have been so busy around my house and frankly, I was suffering from severe mental block. I could not find anything worth writing. That is until now. One of my nieces married the love of her life this past Saturday. Now that woke me up. Weddings usually cause the females in the crowd to cry. That certainly was the case this past Saturday. However, it worked on me as well. And I don’t apologize for that. Shelby married a genuine real cowboy. Being a genuine real cowgirl, I never expected anything less. It was a terrific cowboy wedding. All of my nieces are special to me and Shelby is the first of that generation to marry. 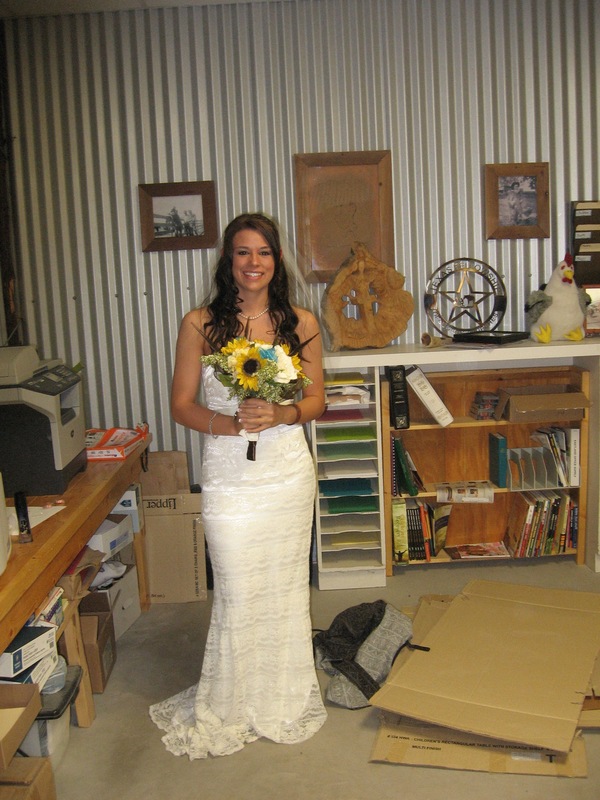 I was honored to preview her in her wedding dress. You can see what a lovely bride she is. In honor of Chase and Shelby and as a gift to them, I wrote a poem and I want to share it with the blog world. the kind you see in the movies. tucked in my blue denim jeans. they’re sure to come true. Across the prairies and into the wind. wherever the winds may blow.